This summer I had the pleasure of meeting a Canadian cycling aficionado named Nelson Hansen. He recently sent us this review of the new book from Velopress about the rise to prominence of Team 7-Eleven. You can follow him on Twitter: @thebaldbiker. Velopress have been bringing us great books on cycling for years; this fall they released a title that will help define the modern era of North American cycling. Team 7-Eleven: How an Unsung Band of American Cyclists Took on the World – and Won details the rise to prominence of Team 7-Eleven. From humble roots to winning a Grand Tour, the book tells the tale of the team that shaped North American cycling into what it is today. If you are of a certain vintage (for example: if you can remember John Tesh as a cycling commentator), the book brings you back to the days when an American cycling team had the audacity to think they could break into the European peloton. And they did, with equal parts success (they won their first race in Europe) and failure (but were blamed for just about every crash on the road). If you are decidedly younger, the book shows how cycling grew roots in North America and how Team 7-Eleven laid the foundation for the North Americans racing at the top ranks today. Before the red, white and green there was no infrastructure to develop young riders nor a support crew up to the level necessary for European racing. Without Team 7-Eleven there would be no Lance, no Tyler, no David Z. The heart of the book surrounds the stories of the people who made 7-Eleven what it was. We are introduced to each rider one-by-one but it’s Jim Ochowicz who provides the center point for both the team and the book. As team manager, Ochowicz put his hard working Midwestern background to good use building a team originally from a base of athletes who speed skated in the winter and raced bikes in the warmer months. Ochowicz was the heart and soul of the team, right down to designing the iconic red, white and green jerseys. As we read the book we get the feeling that the bold venture of invading the European ranks may not have been as successful without “Och”. And Team 7-Eleven did have considerable success during its run. They wore the yellow jersey and won stages at the Tour de France, came oh so close to winning Paris-Roubaix and won the Giro d’Italia. The Giro win and most notably, Andy Hampsten’s epic day on the Gavia fighting bitter cold and deteriorating road conditions as the snow piled up. This is where the book explains why team 7-Eleven was so successful. Ochowicz had the talent to bring great riders on board, but he was also a meticulous planner and laid out a plan for success on the stage—a plan that included raiding a local ski shop for winter gloves and having hot tea ready at all times. Written by Geoff Drake with the “enthusiastic support” of Jim Ochowicz, the book is full of praise for the team. (If there was any dirt to spill, it wasn’t going to get spilled on these pages.) We learn of the team’s rowdy early days, putting equal effort in dominating the American race scene and partying like frat boys. We also see that when it came time to cross the pond the team did things on their own terms like having female soigneurs and serving Mexican food at the training table. 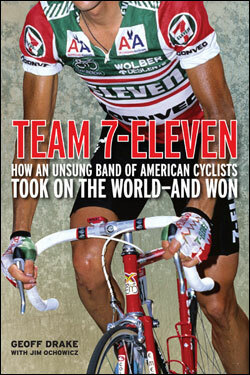 The effect that Team 7-Eleven had on cycling can still be felt today. The squad paved the way for new waves of pros entering the peloton and inspired a generation of North American cyclists to try a previously ignored sport. The book is a great memento and a fitting testament to a team that shaped modern cycling—and with it’s red, white and green cover it will look great under any cyclist’s Christmas tree. This entry was posted in Featured, Musette and tagged Books, Geoff Drake, holiday gift guide, Jim Ochowicz, Team 7-Eleven. Bookmark the permalink.